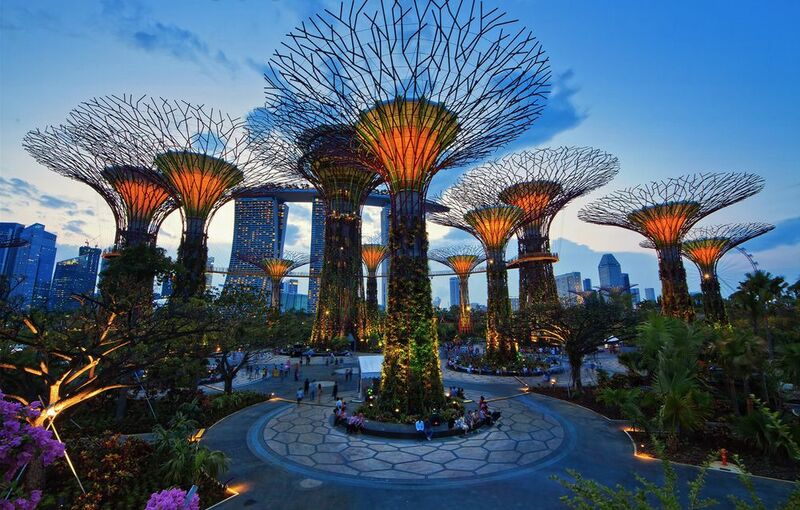 National Parks of Singapore constructed the Gardens by the Bay project, which is a 54-hectar waterfront park at the centre of the new business and leisure district situated to the south of Marina Bay. The masterplan, inspired by the form of an orchid, sought to encompass the best of Singapore’s horticulture and technology with an exemplary approach to environmental sustainability and education. The Supertrees are a series of magical vertical gardens that range from 25m - 50m in height. In addition to magnificent ways of displaying plants, these superstructures are the environmental engines for the cooled conservatories, located at another part of the garden, and the energy network backbone across the site. 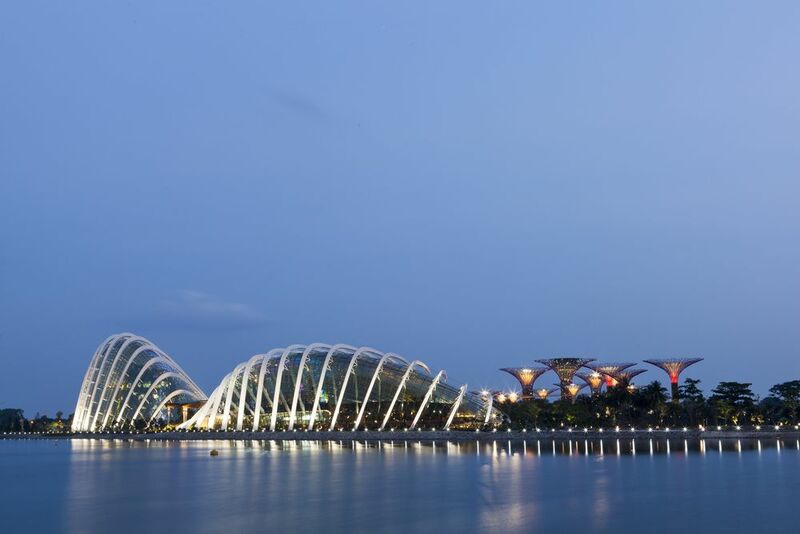 They include devices for water harvesting, air in-take and exhaust, photovoltaic arrays and solar collectors as well as providing an iconic landmark for the scheme and Singapore. Two glass conservatories house plants from around the globe; the conservatories are the largest free spanning glass conservatories ever to be built and require a high performance envelope in which the structure plays an integral part by being the lightest possible structure to allow the maximum amount of sunlight in. To minimise the energy used to cool the two conservatories, massive heat exchangers and dehumidifiers run day and night to maintain conditions suitable for the planting. The excess heat produced by the conservatories is used and finally expelled via the Supertrees. 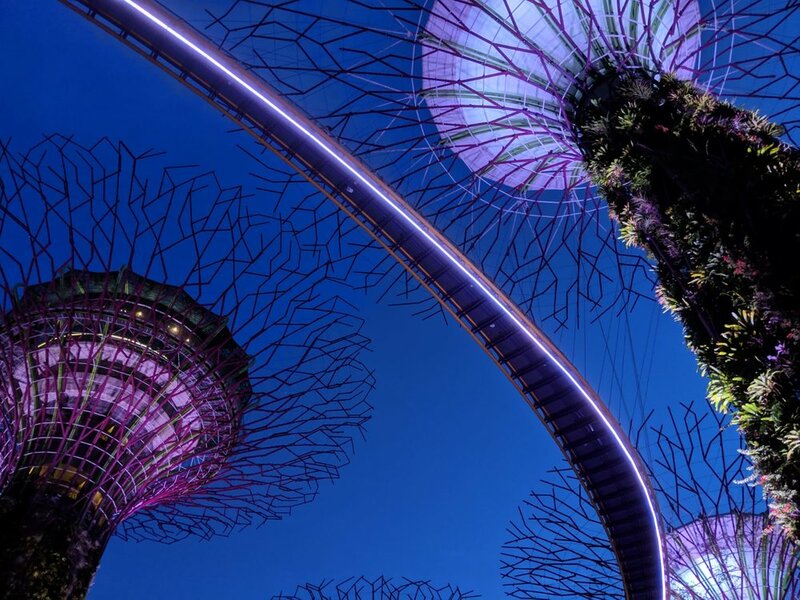 As part of the Gardens by the Bay development in Singapore, Atelier One developed the 136m long aerial walkway to connect the 30-42m tall Environmental stylised Trees in the Supertree Grove. The aerial walkway mimics the tree top walkways so synonymous with Australia, however, it differs in that it is suspended from the Supertrees via extremely light and sensitive skins. The walkway is designed with very specific criteria in mind and due to the sensitivity of the walkway it is designed only for a limited capacity. The bridge / walkway is a simple structure floor beams spanning side to side onto a pair of tubular longitudinal stringers. These longitudinal stringers are picked up at regular intervals by hangers which attach through the skin to the core stiff structure.